With all kinds of different options out there when it comes to credit cards, choosing what is important to you can be difficult. That’s why we built the creditcardGenius slider system – so finding the right credit card for you is painless and fun. Let’s take a quick run through popular credit card features and the choices available to you through our sliders, so you can better decide what type of credit card is right for you. What are ‘Cash Back’ Credit Cards? Cash back rewards are best when you want simplicity in your rewards. They have a set earning rate so you’ll know what you’ll be earning on all of your spend. Your return on spending is basically calculated for you. A 2% cash back card gives you a 2% return on spending. Simple. The catch? Even for higher-end cards, cash back cards have lower annual earn rates than their travel card equivalents. Far fewer cash back cards come with welcome bonuses, and those that do are typically worth far less. Cards with cash back rewards will show up under the ‘Cash’, ‘Flexible’ and ‘Travel+’ slider positions because cash is the most flexible and can be used for anything, including travel. 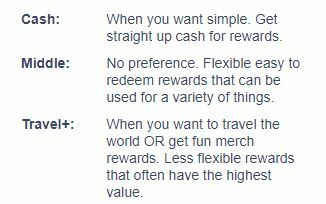 They don’t tend to rank as highly though because their return on spending and extra perks are typically lower than rewards cards. Does not offer the highest earning potential – while you have a set earn rate, these cards may not have the highest earning potential compared to points or miles based cards. Lower annual fees – for the higher end cards, the annual fees are typically less than their travel reward equivalents. Limited travel insurance coverage – most cash back cards do not have the greatest insurance packages when compared to their travel equivalents. If you travel often this is something to take into consideration. Welcome bonuses are hit and miss – they can be good but usually not great and are often non-existent on no-fee cards. What are ‘Flexible Rewards’ Credit Cards? Many travel and rewards cards can redeem your points not only in multiple ways, but also without a lot of restrictions, blackout dates, limited availability, or hoops to jump through. We call this a flex rewards card. Cards with flexible rewards, will show up in both the ‘Travel +’ and the middle flex categories. And depending on the card can show up the cash back category as well. These cards will have the same pros and cons as the travel cards, but come with the added flexibility in how you can redeem your rewards. Get a statement credit for any purchase you make to the card - basically cash but lowest reward value. Use the American Express Fixed Points Travel Program to redeem for flights booked through the Amex Travel Agency at a fixed point rate - much higher reward value. Convert points to Aeroplan miles and redeem them for high value flights – typically the highest reward value but limited availability, blackout dates, and other hoops to jump through. Easier to redeem for rewards in ways you want. Typically the easier the redemption, the less the reward value. Generally higher reward value over cash back cards. Extra perks like airport lounge access often included. Store rewards – those that earn rewards to be used at specific stores and retailers. Cards that have low-flexibility travel or store rewards will usually only show up under the ‘Travel +’ slider position. However, if you can also redeem your miles for real cash or flexible rewards in some way (typically at a much lower value), then they will also show up under other slider positions. These two categories will be discussed separately. What are ‘Travel Rewards’ Credit Cards? Travel cards as a group generally tend to offer the highest overall rewards. But these cards can come at a downside of only being able to redeem your rewards on travel purchases. Sometimes other reward choices are available but they typically have a much lower end value. Depending on how often you travel, you may have to wait a while to redeem your rewards. Travel cards tend to have the best insurance packages as well ‒ and have the highest annual fees for credit cards to account for the extra perks you get to enjoy. If you have a card that is specific to one company, you sometimes also get specific perks when travelling with that company. Take the for instance. When you travel on an Aeroplan flight reward, Air Canada will give you a free checked bag, priority check in (especially great for big airports with long lines like Toronto & Vancouver), priority boarding and access to a maple leaf lounge (once per year). Then there’s welcome bonuses ‒ these tend to be more valuable with travel rewards cards. That same TD Aeroplan card has welcome bonuses worth up to 25,000 miles – enough to take you anywhere in Canada or the continental United States. Depending on where you’re going you can easily get a value between $500 and $800 or more. In comparison, the best cash back cards have bonuses that top out around $300. Generally have higher reward value over cash back and flexible rewards. They have some of the highest annual fees. Tend to have the best insurance packages. Rewards redemption isn’t simple – depending on your card, you may have to wait to redeem you rewards until enough points are built up. More free perks including extra brand-specific perks with some cards. Usually have the best welcome bonuses. Another pro for travel is the fun factor. Planning and dreaming what to do and where to go – with your points...is lots of fun. What are ‘Store Rewards’ Credit Cards? If there is particular store or retailer you shop at frequently, it may be worth looking into whether they have a branded credit card. While retail cards will have an average to below average return rate on spend, the earn rate tends to go up when you use it at the retailer it’s designed for. Take the (which earns 1 point per dollar spent). Say in your area a general admission movie costs $12.00 and you need a 1,000 points to get that move for free, your earn rate is 1.20% on your base spend (which is an average return). But, use it a Cineplex Theatre where you earn 5 points per dollar spent, and you get a very high return of 6% on your Cineplex spend (close to one of the highest returns you can get). Another benefit is that sometimes cardholders will be given special discounts, offers, or increased rewards several times throughout the year. These offers are typically above and beyond what the everyday shopper will get, even during a big sale. They can also have some decent welcome bonuses. The Scene Visa will give you 2,000 points after spending $500 in the first 3 months – enough for 2 general admission tickets. These cards also typically come with no annual fee, but generally lack any kind of insurance package. Great returns for the spend at the card’s specific retailer(s). Average return on spend at other retailers. Can have good welcome bonuses. Depending on what you want in a card, there may be an annual fee associated with it. Credit cards come with annual fee to compensate card issuers for the higher rewards and access to helpful money saving perks – and one of those main perks is insurance. So, deciding which is more important – no annual fee or comprehensive insurance coverage – is what our second slider is all about. Our low fee slider heavily prioritizes cards with lower annual fees, but you still might see the odd card with an annual fee show up near the top. That happens when a card is so good that its reasonable annual fee is well worth it for all the extra rewards and benefits you would be getting. If you leave all other sliders in the middle, and only choose 'low fees' as an option, the number one card that shows up is the . This card has been making quite a name for itself do to the fact that it is one of the few cards in Canada that waives the 2.5% foreign currency transaction fee that 99% of Canadian credit cards charge. This card is also a no fee card that gives cardholders a solid 1% cash back on all their purchases, with no limits and no caps, and free roadside assistance coverage to boot. Something to note: Unfortunately, this card is not available in Quebec. What Are ‘No Fee’ Credit Cards? Quite simply these are credit cards that have absolutely no annual fee, which at first glance seems very attractive. To justify paying an annual fee, you would need to be spending around $1,200 per month to offset the annual fees from the extra rewards value you get from spending on the card. The one big exception to that is that some cards come with specific perks, companion flights or free checked bags for example, that might be highly valuable to you even if you spend less. If you’re interested in perks, make sure you select ‘Perks’ on the 3rd slider. An annual fee card will generally also have better welcome bonuses (especially the travel cards as you know). One way to possibly get the best of both worlds (no fee with high return on spending), is to consider retail or store cards. There is also nothing wrong with going with a straightforward no fee card – just know you won’t get the best return possible. For more accurate and more personalized results and to see if it would make more sense for you to have a no fee card, use our monthly spending calculator in the sidebar. Many people might not even realize that their credit card comes with insurance coverage. But this is a perk that could end up saving you money. 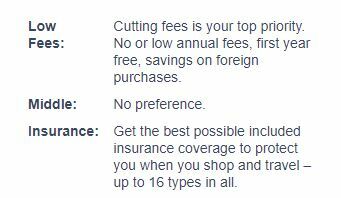 While there is no one credit card that comes with all 16 types of insurance, the comes with 14 of those 16 types. For starters, credit cards that come with impressive insurance coverage usually have a lot more to offer as well. They are often premium cards with valuable rewards and many other perks. Also, it is always important to read your credit card's insurance certificate. There are limits and exceptions for coverage for many of the different types and it is important to make sure you know exactly what it is you're getting. What are ‘Low Interest’ Credit Cards? If you carry more than trivial balance on your card, you’re much better off forgoing any rewards and getting a reduced interest rate card. For example, say you have a balance of $2,000 on your card and say a typical card has an interest rate of 20% – you are paying $400 a year in interest alone. On a typical spend, you’re wiping out your rewards on a typical $2,000/month spend. 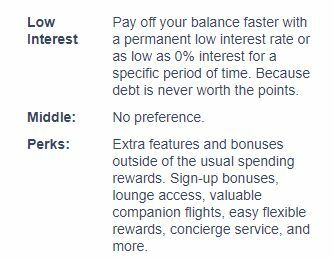 Switching to a low rate card like the , which has an introductory rate of 1.99% for 6 months (and a rate of 8.99% after that) – you would pay $109.90 in interest for the year. A savings of $290.10 for the year. Another good card is the with 0% introductory rate for 12 months. What are Credit Card ‘Perks’? That means, if you don’t carry a balance, then the added perks that premium cards offer may be the way to go. Premium cards typically have an annual fee of at least $120 and a typical purchase interest rate of around 19.99%. Read our list of 17 credit card perks how they work. If you've been on our compare cards page, you might have noticed that there is a 4th slider there. This slider breaks down two things that people are often concerned about – acceptance and approval. 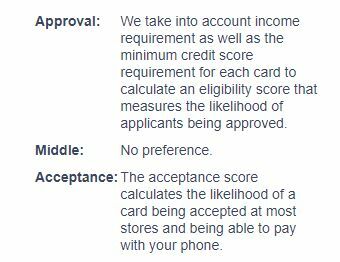 How likely are you to be approved when you apply for a specific credit card? To answer this question we take into account both the minimum income requirement as well as the approximate minimum credit score required for approval. So, if you think you don't have the best credit score, or you are new to the credit card game, or you don't have a very high income ‒ this might be a setting that is important to you. How likely is your card accepted whenever you shop, dine, and travel...wherever? Not only do we take into account retail store acceptance, we also look at mobile payment. We take into account concerns about Amex acceptance, and between Mastercard and Visa ‒ Mastercard has the edge because of Costco. Deciding what’s most important to you in a card isn’t always straightforward, so we hope this guide is helpful. In case we missed something, send us a note using our contact form.